golden bird knits: Tagged, I'm It. Busy, busy, busy. I have my hands full with my sock knitting class, ATC swap group, and the lace knit-along. And I might start taking a new knitting class where every Saturday you work on a different square for an afghan. It's fun being involved in so many creative, crafty projects, but I'm having a bit of trouble finding time for everything. 1) I colored my hair every color of the rainbow for over twenty years. These days it's all natural, dark brown speckled with gray. I love not having to color it every month and don't miss dripping hair dye all over the counters and carpet. But I would like a few highlights. 2) About a year after I learned to knit I decided I didn't like it and gave all of my needles to Dogwood. Two weeks later I found myself standing in front of the yarn display at Michael's, desperately wanting to knit something. Dogwood was kind enough to return my needles to me. 3) Speaking of Dogwood, thirteen years ago she and I, along with her family and friends, hiked to the top of Half Dome at Yosemite National Park. It's a 17-mile hike that can take over eight hours to complete. Dogwood had done it before, but I hadn't and found it extremely challenging. (If it wasn't for peer pressure, I would have quit at the point where you have to climb the cables.) It was so difficult that afterward I felt that if I could do that, I could accomplish anything. Sadly, today I get winded walking up a flight of stairs. 4) I have a crush on the character Spike from the Buffy series. The other night I dreamed we went on a date, but he just wasn't that into me. 5) I have always loved to write and have had several essays published in magazines and newspapers. One of my proudest writing accomplishments is having a piece published in The Writer magazine. 6) My favorite song at the moment is "O-o-h Child." Maybe it's because I want to believe things are going to get easier. 7) Yesterday was my one year BLOGIVERSARY! A giveaway is coming as soon as I can find the time to figure out what to give away. I'm supposed to pass along the award, but I don't feel comfortable doing that because I don't want to leave anyone out. If you'd like to play, please grab the award and tell us seven things about yourself. So Dear Stacy, Congrats on your one year anniversary. Mine is coming next month. Happy Blogoversary! What an accomplishment! Another accomplishment you should be proud of? The cables! I took a look at that picture and my stomach dropped! Happy Blogiversary Stacy! (How DO we spell that anyway?) Fun little snippets -- especially about the knitting! Stacy, I'm laughing about the giving up knitting and then craving it after the fact. I'm done similar things, my husband claims I am just so fickle. Congrats on the blogersary! I just missed my year mark also at the end of January. cute Dogwood story & reason you like your song! Fun list. I knew most of the things on your list but not all. Welcome, the the grey hair club. Highlights would be nice. Fun remembering our hike to the top of half-done. I was so proud of you! Congrats on a year of blogging! The doll house picture is a photo of a greeting card. It's fun to learn more about you!! I think that I may stop coloring my hair...hey I'm almost 55...and hopefully not ALL GREY!!! Happy Blog Birthday!!! A year already! Keep going up the mountain!! It's so great getting to know you better! And happy blogversary - wow, where did the time go? I constantly run hot and cold with my knitting - I love it, then put it away for loooooong months at a time. Thinking about the holidays usually brings out my needles again! My husband is always after me about hiking. Please don't ever tell him about Half Dome!! 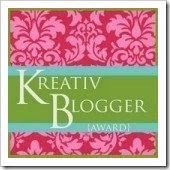 Cool that you got the Kreativ Blogger award, and congrats on your one year blogiversary! And I just have to say - Spike totally has it over Angel. MMMmmmm!!! Oh happy happy Blogiversary. I was sure you'd been around here longer than me! I loved reading your post today. I can't believe you gave away all your knitting needles. That makes me chuckle. My way would be to stick them somewhere in my already-crowded sewing room until I (inevitably) decided to knit again... which explains why I had an almost full set of needles when I hadn't knit for over 12 years. Sorry if my comments are a bit short and sweet lately, I have not got my energy back yet. But the feelings all there and I love reading your blog and I Love all Your Beautiful work. Stitches is coming! Stitches is coming! Ready, set ... knit some lace!